Not a fan of roast Turkey? Find this replacement for your Christmas dinner spread with this simple and easy Roast Chicken recipe. Marinade a whole chicken with salt and pepper, and set aside for 20 minutes before cooking. Heat up the oven to 150 degrees Celsius. Put 2 cups of oil in a baking dish, and heat it up in the oven. In the mean time, brush honey all over the surface of the roast chicken. Once the oil is heated up, carefully remove the tray from the oven. Place the whole chicken into the tray and baste it with the oil. Then place the tray in the oven and leave to cook for 30 minutes, or until the chicken skin turns golden brown. Remove from oven to cool. Bring a pot of water to boil. Add 1 teaspoon of salt and stir until dissolved. Boil potatoes for around 15 minutes or until cooked. Remove and drain potatoes, and allow to cool before peeling them. In a separate pot or saucepan, melt 1cm of butter on medium low heat, and toss potatoes to coat them evenly. For the vegetables, bring another pot of water to boil with one teaspoon of salt. Add carrots into the saucepan first. When the carrots begin to soften a little, add the french beans and boil for about 2-3 mins. Drain the vegetables. In a separate pot or saucepan, melt 1cm of butter on medium low heat, and toss vegetables to coat them evenly. In a separate bowl, mix cornflour, water and dark soya sauce evenly. 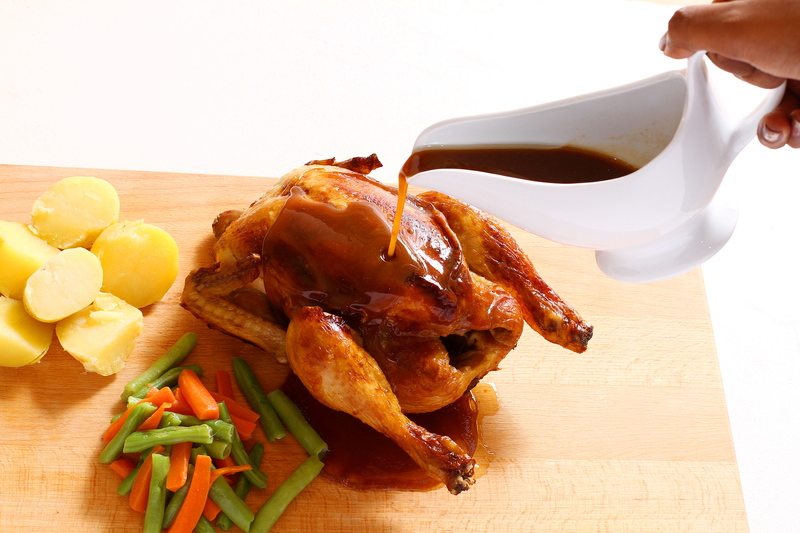 Take 1/2 cup of leftover juices from the roast chicken and set it in a small saucepan over medium heat. Add the mix to the sauce pan and stir quickly and continuously to avoid any clumping. Add chicken stock if using, and stir until dissolved. Continue stirring until the gravy thickens. If it gets too thick, add water, 1 tablespoon at a time, until it reaches your desired consistency. Serve by drizzling generously over roast chicken.